A fully soluble fertiliser that provides nitrogen and magnesium nutrition for vegetables, fruits, vines, flowers, turf and ornamentals. The nitrogen in magnesium nitrate is fully available to plants and provides an immediate and predictable growth response. At the centre of every chlorophyll molecule there is a magnesium atom. Chlorophyll gives plants there green colour and allows plants to properly photosynthesize. A lack of magnesium can reduce the green pigmentation in plants and reduce photosynthesis. Magnesium Nitrate is a fully soluble and available fertiliser and allows magnesium and nitrogen nutrition to be applied via fertigation and/ or foliar application. Where magnesium requirements are high and supply is lacking. Magnesium Nitrate can be a significant part of the total nitrogen budgeting for the fertiliser program. However, the quick acting form of magnesium nitrate means that the product can be specifically applied in response to plant or visual analysis to correct or prevent a deficiency of magnesium and/ or nitrogen occurring. Campbells Nitro-Mag greenhouse grade can be applied through the fertigation system, as a foliar spray and can also be used in hydroponic systems. Magnesium Nitrate is particularly suitable in high value vegetable crops where colour and visual appearance is important for the end product. General rates for horticultural crops are between 25 to 50 kg/ha through the fertigation system. 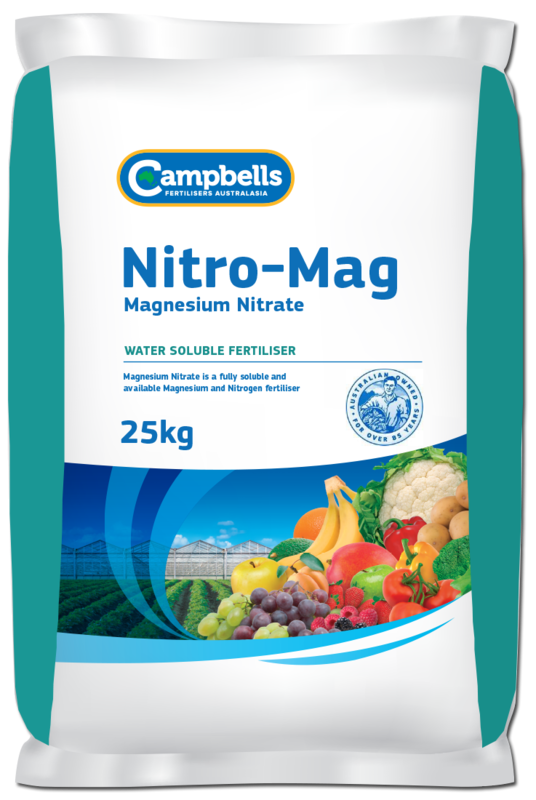 When applying Campbells Nitro-Mag through the irrigation system more frequent and smaller applications guarantee the nutrients are supplied to the plants without being lost due leaching or excessive rainfall. General foliar application rates are at a concentration of 0.5-1%. Avoid foliar application during extremes of climate and during flowering. The actual rates, number of applications and their timing will vary considerably for different crops and for different districts. Before application, seek advice from your Campbells Nitro-Mag distributor or your local agronomist.